Several days before Christmas 2003, John Gregory Dunne and Joan Didion saw their only daughter, Quintana, fall ill with what seemed at first flu, then pneumonia, then complete septic shock. She was put into an induced coma and placed on life support. Days later–the night before New Year's Eve–the Dunnes were just sitting down to dinner after visiting the hospital when John Gregory Dunne suffered a massive and fatal coronary. In a second, this close, symbiotic partnership of forty years was over. Four weeks later, their daughter pulled through. Two months after that, arriving at LAX, she collapsed and underwent six hours of brain surgery at UCLA Medical Center to relieve a massive hematoma. This powerful book is Didion's attempt to make sense of the "weeks and then months that cut loose any fixed idea I ever had about death, about illness . . . about marriage and children and memory . . . about the shallowness of sanity, about life itself." born December 5, 1934 is an American journalist and writer of novels, screenplays, and autobiographical works. 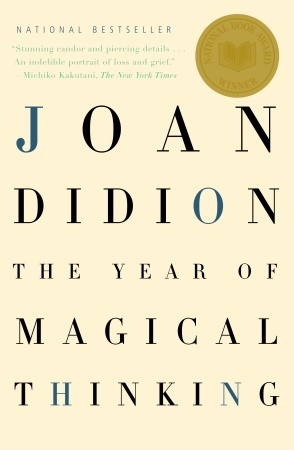 Didion is best known for her literary journalism and memoirs. In her novels and essays, Didion explores the disintegration of American morals and cultural chaos; the overriding theme of her work is individual and social fragmentation. In 2005, she won the National Book Award for Nonfiction and was a finalist for both the National Book Critics Circle Award and the Pulitzer Prize for Biography/Autobiography for The Year of Magical Thinking.